The 2009 Victorian bushfires on Saturday 7 February 2009 were the worst bushfires in Australia's history, surpassing both the Ash Wednesday fires in 1983 and the Black Friday fires in 1939. The bushfires travelled at alarming speed, up to 100km/h, across farmland and through plantations and heavily "managed" forests, including forests where recent fuel reduction burns had been done. 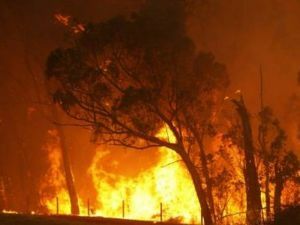 Bushfire and climate scientists have confirmed that Victoria's hottest day every, combined with very strong north winds, created conditions for an unstoppable firestorm. 6.5 Rebuilding with prefabricated "pods"
Initial track of the fires that started at Kilmore East and Murrindindi Mill. Note that the fire fronts changed direction to travel North East after the southerly wind change. This wind change created a huge fire front along the entire edges of the previous fire track, and resulted in Flowerdale being burnt. 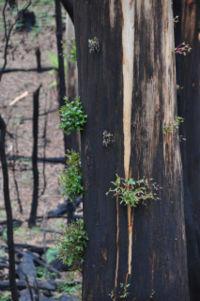 The bushfires slowed considerably when they eventually entered Melbourne's water catchments, but they continued to burn. Intact wet sclerophyll forests in our water catchments are less prone to burning, and temperatures and wind speeds have eased. Delburn fire started in Gippsland, arson suspected. Wandong, Kinglake West, Strathewan, Kinglake and Steels Creek and Flowerdale townships burnt. Murrindindi Mill fire started, arson suspected. Narbethong and Marysville townships burnt. Churchill fire started, arson suspected. Kilmore and Murrindindi Mill fires merge to form the Kinglake fire complex. The fires came as Melbourne reached its hottest ever temperature of 46.4 degrees. The extremely hot temperatures were accompanied by very strong north westerly winds, which changed to strong south easterly winds in the late afternoon. The combination of extreme heat and very strong winds resulted in the highest ever fire danger index warnings recorded in Australia. The fire danger index scale ranges from 0 to 100, with 100 being extreme fire danger. During Saturday 7 February, index warnings above 150 across Victoria were advised, with some areas exceeding 200. 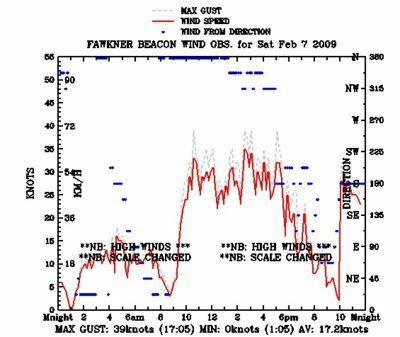 The strong north winds and the southerly wind change on February 7th were not unusual in themselves, but combined with the above factors, and ignition of the fires, the results were catastrophic. 140 to 190: Black Saturday. These figures have never been seen before and are regarded as in the "catastrophic" range. Professor Karoly also pointed out that CSIRO scientific predictions are that the current rate of climate change were are experiencing will result in 4 times as many extreme fire dangers days like Black Saturday each year by 2050. Observed increases in forest fire activity have been linked to climate change in the western US, in Canada, in Spain and in Greece. The fires have destroyed at least 1,834 homes, with thousands more suffering damage. The fires have left an estimated 7,500 people homeless. As at May 13 , 2009, 173 people are reported dead. Several million native animals are estimated to have died. Millions of tonnes of carbon have been released to the atmosphere. Australia's total emissions per year are around 330m tonnes of CO2. Previous research has shown that the bush fires in 2003 and 2006-07 had put up to 105m tonnes of carbon dioxide into the atmosphere because they burned up land carrying 50 to 80 tonnes of carbon per hectare. This time, however, the forests being destroyed are even more carbon-rich, with more than 100 tonnes of above-ground carbon per hectare. The affected area is more than twice the size of London and takes in more than 20 towns north of Melbourne, so the CO2 emissions from this year's disaster could be far larger than previous fires. An electricity spokesperson stated on the Radio 774 on February 7 that Melbourne was very close to losing its power as a result of these fires. If another power line had been impacted the entire grid would have been temporarily shut down. poles and wires for landline phone networks. transmitter towers for mobile networks. After the fires, there has been much speculation about measures that could be adopted to reduce bushfire risks and impacts. A Royal Commission with a wide terms of reference has been announced by the Victorian Government to investigate these bushfires and make recommendations. Fire-proof bunkers under or near houses. However, bunkers are not classified as structural items under the building code, so improved regulations for them are required. Larger community fire-proof buildings in towns and schools. Clearing vegetation for the close proximity of buildings. 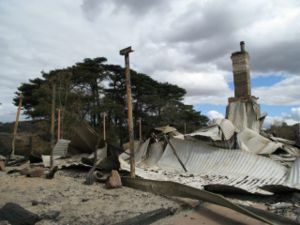 Despite being attacked twice by fire on Black Saturday from two different directions Mr Williams' Steels Creek home stood solid while everything around it was destroyed. Four of his neighbours died. No external timber to catch fire. Door frames are steel and so is part of the balcony. extensive fuel reduction burning has been conducted around Marysville over the last decade and a firebreak was constructed around the town. The Kilmore fire started on and traversed large areas of farmland before it entered forested areas. A relatively small grass fire in Narre Warren burnt several houses before it was contained. Fire behaviour is a dynamic process and therefore needs dynamic modelling. Kevin stated that the extreme weather dominated the fire behaviour rather than fuel loads which played a lesser role. As an example, he mentioned the Lara bushfire on grass paddocks on 8 January 1969 along the Geelong Road that killed 17 people trapped in their cars. In total, 280 fires broke out on the 8th of January 1969. Of these, 12 grass fires reached major proportions and burnt 250,000 hectares. The fires also destroyed 230 houses, 21 other buildings and more than 12,000 stock. radio traffic to and from CFA vehicles was very congested. Many trucks were unable to provide regular situation reports. single "hub" radio operators had to deal with many mobile units. overloading of mobile phone networks due to high call volumes and congestion. The Royal Commission will investigate these matters further. The House re-Growth Pod has been designed by architect who wanted to help with the re-building process of fire destroyed homes in Victoria. The dwelling is a completely self contained concrete service pod which is s a permanent and cost effective housing unit which can assist in the rebuilding of the fire devastated town-ships of Victoria. The causes and circumstances of the bushfires. 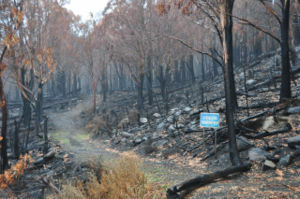 The preparation and planning by governments, emergency services, other entities, the community and households for bushfires in Victoria, including current laws, policies, practices, resources and strategies for the prevention, identification, evaluation, management and communication of bushfire threats and risks. All aspects of the response to the 2009 bushfires including immediate management, response and recovery, resourcing and coordination and equipment and communication systems. The preparation and planning for future bushfire threats and risks, particularly the prevention of loss of life. Training, infrastructure, and overall resourcing needs. Bush Fire, myenvironment.net.au, scientific and evidenced based information about bushfires and the environment with links to media, science, research and opinion articles. This page was last modified 23:10, 12 January 2010. This page has been accessed 379,258 times.